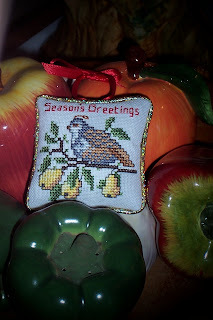 I am finally posting my first ornament finish for 2009. This is a freebie from Gazette94. 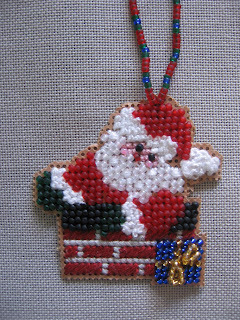 I stitched it on a scrap of Gold 14ct Aida using Carrie's Creation Floss called "Holly Days". Not sure how it will finally end up but the stitching is done. 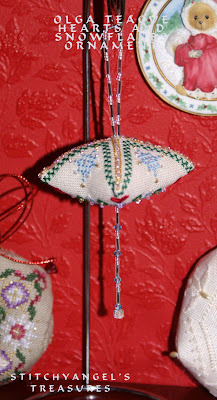 I have already started a second ornament from Gazette94 for February. 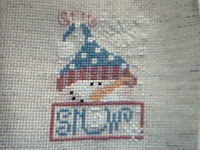 "Let It Snow" design by Barbara Ana on 14 ct oatmeal aida with DMC threads. This is my first ornament of the year. 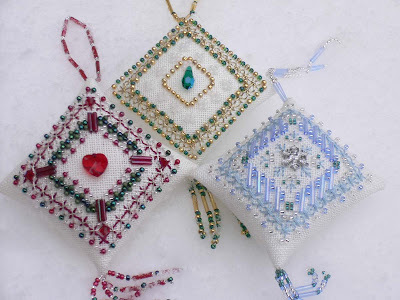 It is Olga Teague's ( Olenka's Stitches) Hearts and Snowflakes icicle ornament. There are more photos of it on my blog if you'd like to have a look. 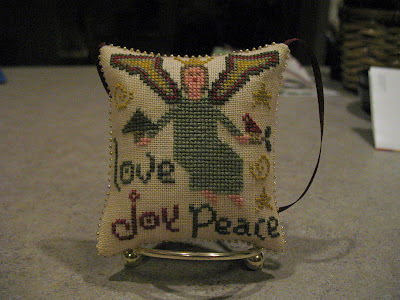 This is my first ornament finished in 2009. 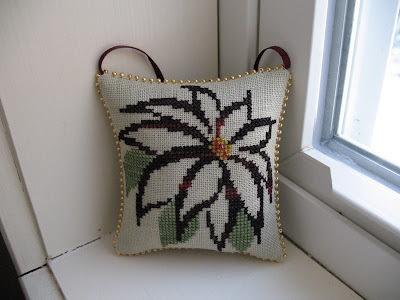 A Mill Hill design worked on perforated paper with thread and lots of beads. 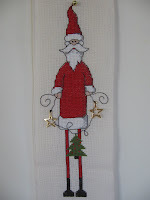 It is called 'Down the Chimney' - fun to stitch and quite quick. 32 count Cream Belfast Linen fabric using DMC threads. I know - it barely looks like the version in the magazine, which is very nice, but I really wanted to personalize this piece for my husband and I since we bought our first home in June. The most obvious change is changing the door from green to red. I also added a brass kickplate and house numbers and left off the wreath treasure. Oh, and the bushes are a little bigger because I screwed up a little and started them higher than they should have been, so I had to make some adjustments. And while I was at it, I changed the Welcome to our name (blurred for privacy), and added our new town and the date at the bottom. Hi, I'm new to the SAL and this is my first post. I have two ornie finishes to share with you today. 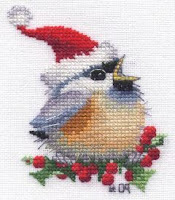 I will do my best to keep up the momentum to stitch along with everyone throughout the year. 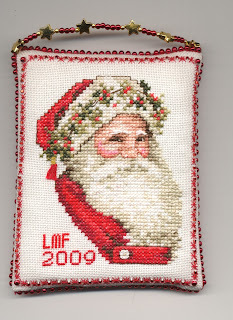 Peppermint Paul from The Gift of Stitching, issue #34 -- Stitched on 32ct. Belfast linen (Spanish Moss) I used Mill Hill beads for the peppermint candy. 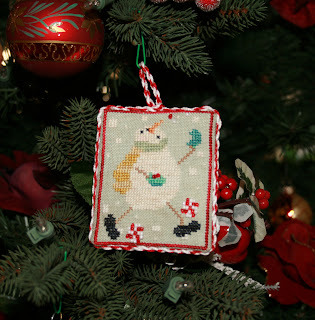 A Christmas Visit by The Prairie Schooler Book # 48 - Stitched on 32ct. natural Belfast linen. 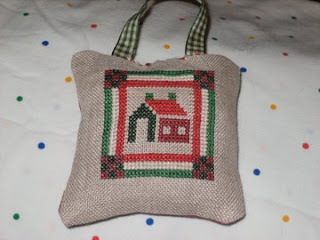 Labels: The Gift of Stitching, The Prairie Schooler, Veronica R.
I finished this by whipstitching most of the edges together with beads, then slipping a piece of cardboard into the pocket and closing off the top. I originally intended to make a little pillow like they did in the magazine, but I thought it looked nicer a little flatter. On the back, I used the same fabric and stitched our name and 2007 in red thread. 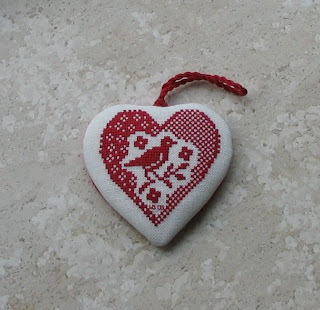 I didn't use the recommended buttons - stitching in the hearts instead and skipping the cardinal button altogether. 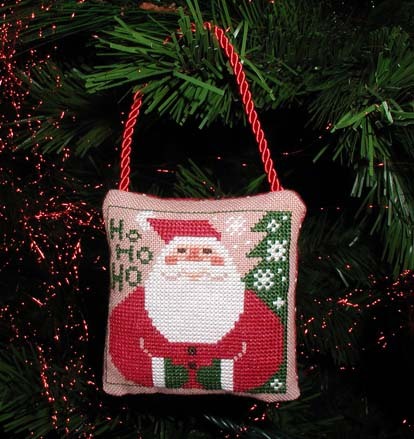 It's Carol Emmer's Santa Bellpull (finished as an ornament, not a bellpull) from the JCS Ornament Issue 1997. 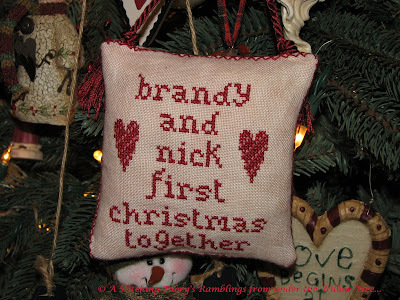 This is my final ornament for 2008. I finished it just few days before Xmas. I made this for a dear Internet friend. Now that she's received it I can post a photo. 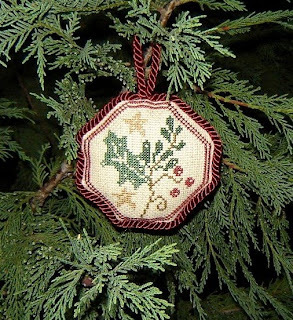 This little piece is called "Christmas Quilt", by KJ Designs. It was in the 1984 JCS Ornaments issue. 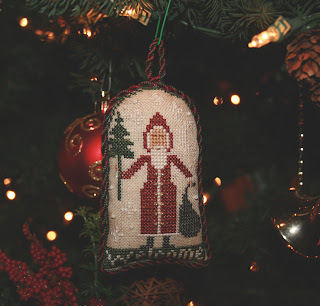 Also from an older JCS magazine, this is by Lindy Jane Designs, and it's from the 1985 ornaments issue. It's just called "Merry Christmas Ornament." 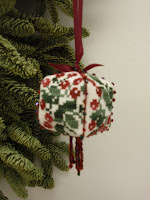 Although this decoration was finished in time for Christmas I had missed getting a photo to send. 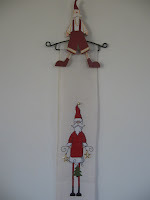 The design is from the Germany publication Rico book no.108 Winter Fairytale and I purchased the cute matching wooden hanger and bookat Spinning Jenny's in England. Since returning from my UK holiday I have seen the book and hanger here in Melbourne. 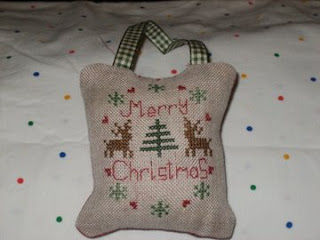 It was a quick project working on the linen band and using DMC thread. 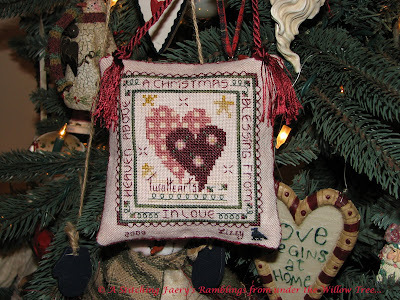 Wishing you all a Blessed and Joyful Stitchy New Year! trimmed at the top with a Swarovski Crystal. Here are my recent Christmas bauble finishes. Happy New Year everyone! Joy and Happiness! 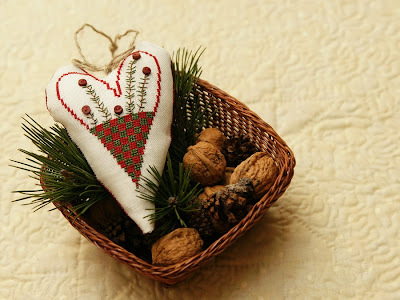 This is my december "Christmas ornaments". 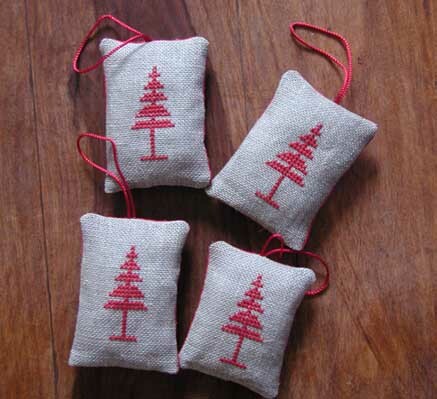 I created these ornaments to add to the Xmas gifts for my cousins.